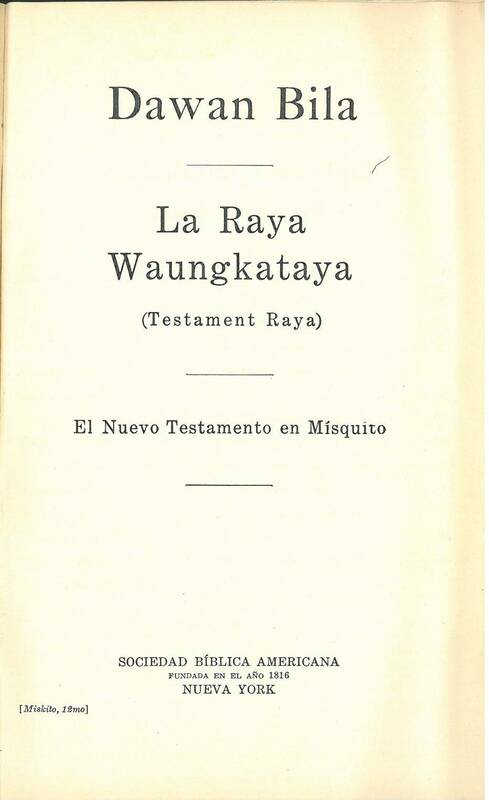 Title: Dawan Bila La Raya Waungkataya (Testament Raya) El Neuvo Testamento en Misquito. References: Book of a Thousand Tongues (1972) entry 865. Comments: This is probably a reprint of the 1926 New Testament. 1889 Gospels, Acts, 1904 Psalms, 1905 New Testament Herrnhut Bible Society, Herrnhut Translated by Moravian missionaries, including P. Blair, W.W. Sieborger, H. Berchenhagen, H. Ziock, A. Erdmann, and F. Kern. 1926 New Testament, 1958 Psalms (with Spanish) American Bible Society, New York. Translated by George R. Heath and later, Werner Marx, Moravian missionaries. — From The Book of a Thousand Tongues entry 865.